15 October 2010, at 4:57p.m. KENYA - The inaugural Kenchic Arbor Acres Seminar was held in Nairobi on 13 and 14 September, attended by representatives from leading poultry farms and hatcheries from Uganda, Tanzania and Kenya. Muraya Muiru, Managing Director of Kenchic Ltd, welcomed the delegates to the seminar which focused on the practical aspects of poultry management in the region. On behalf of the Arbor Acres team, Stanley Millar, Commercial Manager for Turkey, the Middle East and Africa (TMEA), welcomed the guests and opened the seminar with a presentation on Arbor Acres performance and activities throughout the world, illustrating its popularity is growing fast with many prestigious companies around the world. Technical Manager for TMEA, Mohsen Ganjaei, followed with a presentation on breeder management and hatching egg care and handling. Regional Arbor Acres Veterinary Specialist, Dr Akos Klausz, then highlighted the importance of maintaining high standards of biosecurity and the need to learn from the lessons of more developed markets, where biosecurity failures can be extremely painful to their enterprises. Kenchic's Sales and Technical Manager, William Opiyo, made a presentation on broiler management which was specifically geared to the regional housing facilities and environment, and how broiler growers should best apply technology when often operating with limited resources. Pietro Stella from Euro Poultry, a major producer from Dar es Salaam, Tanzania, commented that results from the his AA parent stock, bought from Kenchic, have shown exceptionally good performance, making AA broilers the farmers' preferred breed in Tanzania. He commended Kenchic and the Arbor Acres team for their continuous and prompt technical support in Tanzania. The Chairman of the Kenya Veterinary Board, Dr Yamo, highly praised the conference: "Quality poultry farming begins with a good breed and best practices in breeder management, the main objective of the conference. I would like to thank the Kenchic and Arbor Acres teams for their efforts in sharing information, gained from international and local experience, with farmers in the region through a specially organised and tailor-made seminar. This advice will be very beneficial in ensuring consistently improved performance for our farmers." Stanley Millar comment on the event: "The Arbor Acres Plus has now become established as a very popular breed in Africa and in acknowledgment of this loyalty, Aviagen wish to be measured not only as dependable suppliers but actively supporting our customers through technical transfer to improve their performance and profits. "Aviagen, through the Arbor Acres brand, has been in partnership with Kenchic Ltd since the first parent stock was placed on their facilities back in 1984. 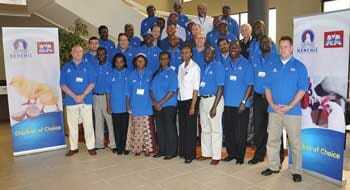 Since 1989, Kenchic have been the AA brand franchise distributor for East and Sub Saharan Africa. Over the years, the Arbor Acres–Kenchic reputation has grown throughout the territory and the company is now widely recognised as a leading and reputable supplier of Arbor Acres Plus broiler parent stock."